Summertime means arts and crafts fairs, and communities in Mason County often include these fairs as part of their festivals. Many talented people from near and far offer their wares for sale, often in an outdoor setting. Here you can find many unique handcrafted and artistic items for your own home or for gift-giving. Here are the summer arts and crafts fairs that usually occur. Dates for 2019 are being listed as they become available. 25 - Art, Craft & Vendor Show, 10am-4pm, Shagway Arts Barn, 5949 Shagway Road, Ludington. 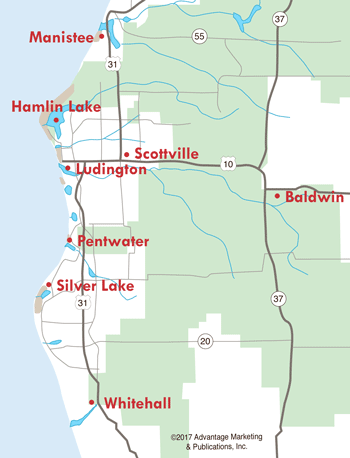 25 - West Shore Family Support Arts/Crafts Fair, 10am-4pm, Rotary Park, downtown Ludington. 1 - Maritime Magic Arts/Crafts Show, 9am-3pm, Indoors, Ludington Area Center for the Arts. 22 - Art, Craft & Vendor Show, 10am-4pm, Shagway Arts Barn, 5949 Shagway Road, Ludington. 6 & 7 - West Shore Art Fair, 10am, Rotary Park, downtown Ludington. - Arts & Crafts Fair, 10am-3pm, Free Soil Townhall, Free Soil. 20 - Art, Craft & Vendor Show, 10am-4pm, Shagway Arts Barn, 5949 Shagway Road, Ludington. 10 & 11 - Gold Coast Artisan Fair, 10am, Rotary Park, downtown Ludington. Application information, click here. - Fountain Car Party & Craft Show, 9am-3pm, Sherman Township Hall, Fountain. 24 - Art, Craft & Vendor Show, 10am-4pm, Shagway Arts Barn, 5949 Shagway Road, Ludington. - Grant Township Fire Department, 855 W. Hoague Road. 31 - LACA Indoor Juried Fine Art Fair, 10am-3pm, Ludington Area Center for the Arts. 21 - Art, Craft & Vendor Show, 10am-4pm, Shagway Arts Barn, 5949 Shagway Road, Ludington. 12 - Art, Craft & Vendor Show, 10am-4pm, Shagway Arts Barn, 5949 Shagway Road, Ludington.